Admittedly, no, i really didn’t know much of anything about Simpson & Vail before today. I first learned about them all of three months ago while reading Jane Pettigrew’s The New Tea Companion. They aren’t quite as big as Upton Tea Imports (Simpson & Vail’s Spring catalogue only reaches to 23 pages as compared to Upton’s 54 pages), neither do they have as many uber-rare teas. However, Simpson & Vail does have examples from every major tea producing region including examples from the Ayurvedic tradition, dessert teas, herbal tisanes, holistic teas and even a strong selection of coffees (that word isn’t necessarily banned from my vocabulary). One thing i particularly like about Simpson & Vail are their CTC and non-CTC blends, many of which I’ve never encountered before. Simpson & Vail is similar in size and retail offerings to TeaGschwendner. However TeaGschwendner was started as a Mom and Pop cafe in Germany in the late 70s. Upton Tea Imports began in 1989. Harney & Sons, 1983. …But are you ready for this? Simpson & Vail is far older: established as a tea seller in 1929, before the fall of the stock market, when 1st Baronet Sir Thomas Lipton was still alive. Actually, as a company, Simpson & Vail is older still, having gotten its start selling coffee in NYC in 1904. More impressive yet, one person, Margaret Trapp Cruse, wife of the co-founder Lester Vail and the company’s first secretary at a time when married women were almost never seen in the workforce, recently passed away at 100, having watched over the company since its beginnings. Even the Charleston Tea Plantation was only founded in the 1960s. In terms of tea industry businesses in the Western Hemisphere, Simpson and Vail’s experience is simply unmatched. Okay, okay, we get it. But what did you buy? As you may or may not know, i really love Nepalese teas. The Western Nepal tea growing region borders Darjeeling. The Eastern growing region may as well be considered the Himalayas. When i saw the image of Sakhira Estate 1st Flush’s loose leaf below i was sold (can you believe this is Black?!). Later i found the second image below somewhere online and i got even more excited. Sakhira Estate was only first established fifteen years ago, but at 6,000 some odd feet above sea level it’s not difficult to imagine it already garnering international acclaim. Sakhira Estate 1st Flush (S&V) ~ loose leaf macro B by Jocilyn Mors is licensed under a Creative Commons Attribution-ShareAlike 4.0 International License. Image reproduced without permission. Image rights and rights holder unknown. Emerald Green Tea Organic 1st Flush (Simpson & Vail) – loose leaf Macro by Jocilyn Mors is licensed under a Creative Commons Attribution-ShareAlike 4.0 International License. From Lingyun, let’s travel almost exactly 300 miles Northeast within China to Jinshan, Hubei province. Although Hubei is as humid as Darjeeling, it gets far less rainfall than other tea producing regions. Hubei usually produces Keemuns, Gunpowder Greens and Jasmines used for flavoured teas. I rarely encounter teas I think of as really exceptional from Hubei, but I’m hoping this one may be the exception. Six hundred or so miles due South South West of Jinshan and we come to Vietnam’s ancient tea forests. Vietnam’s tea culture is nearly as old as China’s and as i previously mentioned in [the last tea excursion], I’m very interesting in sampling highly rated teas from this region. Vietnam Green Organic is supposedly one of these obscure oriental magic flavor-changing teas… >.>;; Well, i guess we’ll find out. Vietnam Green Organic (S&V) ~ loose leaf macro by Jocilyn Mors is licensed under a Creative Commons Attribution-ShareAlike 4.0 International License. Let’s take one more tea lover’s leap about, ohh, i don’t know, 1,600 miles? South West to Sri Lanka. I’m actively trying learn more about Ceylon tea, and fortunately Simpson & Vail has a nice selection to help get me started. In the Northern wilderness of Nuwara Eliya, sits Lovers Leap Estate and eponymous cliff side. When I saw how dense this forest was, and read that Lovers Leap Estate teas are supposed to have a “forest note”, i really wanted to test that advertisement. Ceylon Lover’s Leap Estate (S&V) ~ loose leaf Macro by Jocilyn Mors is licensed under a Creative Commons Attribution-ShareAlike 4.0 International License. From Nuwara Eliya we move directly into the next province West, Uva. 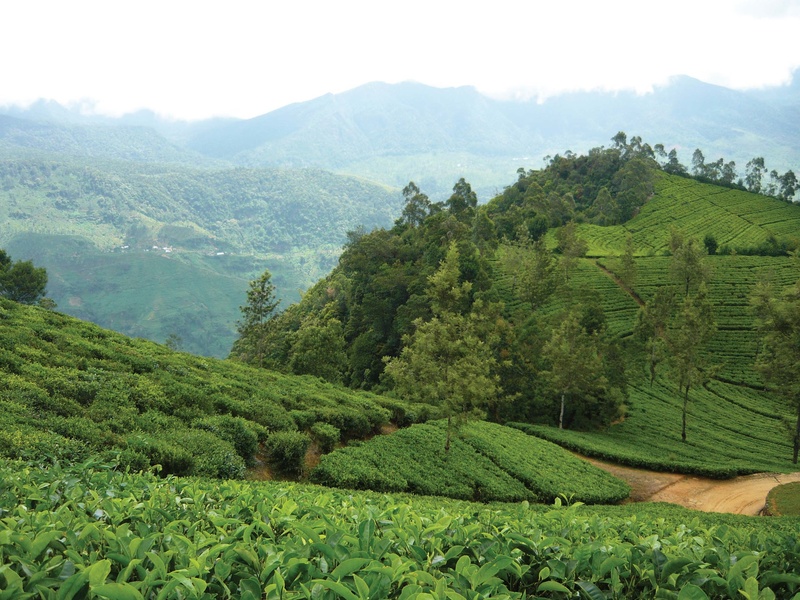 Uva is by far the largest tea producing region in Sri Lanka by area. Uva also gets some of the best rains and winds in Sri Lanka, which of course produces larger tea yields. I was interested in Thotulagalla Estate as its certified fair trade and its workers enjoy many 2nd world benefits… Well, that, and, it also just happens to be located at 6,000 feet above sea level (are you seeing a pattern emerging? xD). Image reproduced without permission. Image Copyright © 2015 Dilmahtea.com. All rights reserved. Probably the most famous tea Estate in Uva, toward the East, in its own enormous chunk of the province lies the Idulgashinna Organic Tea Gardens. Blackwood is just one section somewhere within that huge tract of land. 1,100 workers and their families live in Blackwood. They enjoy better than usual, almost 1st world lives. Green teas from Uva are particularly renowned for their citral, bold taste and color and Blackwood Organic is no exception. Blackwood Estate Green Or (S&V) ~ loose leaf Macro by Jocilyn Mors is licensed under a Creative Commons Attribution-ShareAlike 4.0 International License. Image reproduced without permission. Image Copyright © T-buds.com. All rights reserved. The last tea i purchased from Simpson & Vail doesn’t have a terrior, so i can’t take you there. Glen Lochey is a blend, but amazingly isn’t a CTC. Most blends consist of 3 or more different teas from regions all over the world. Glen Lochey has one of the largest leaf non-CTC blends I’ve come across, and if it’s as sweet, bold and smokey as advertised I will be a pretty satisfied customer. One final thing of note though. When you purchase samples from Simpson & Vail they’re sent wrapped in non-lined paper, not especially helpful for a tea-lover who wants their tea as fresh as can be. I recommend purchasing a quantity large enough to come in a tea tin.